Five National Star students proved disability is no barrier to getting out and about on a bike. 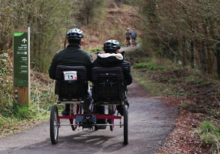 The five, who attend National Star in Hereford and National Star in Wales, used adapted cycles for the experience in the Forest of Dean. The challenge, organised by National Star Senior Physiotherapist, Gabriela Todd, was held at Pedal a Bike Away Centre with support from Mary Clare Faulkner of Wheels For All. Gabriela said the experience provided a range of challenges for the five, from coping with other cyclists to working together and trying different cycles to find the one most suitable for them and their disabilities. The group worked as a team to ride 7km to raise awareness of the 700,000 people with autism in the UK to mark Autism Awareness Week. National Star recently announced it has purchased 1 Ledbury Road from the Wye Valley NHS Trust and plans to invest £2.2 million into the site to long-term living accommodation for young people with disabilities together with an education, personal development and therapies facility. People can donate online to the Hereford appeal. To find out more about the Hereford appeal, telephone 01432 802925.